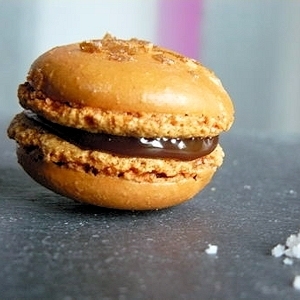 If you’ve spent even a small amount of time in Paris, you know that the macaron is ubiquitous. And in a city of fastidious eaters, it’s significant that a single dessert has managed to win the hearts and minds of so many. But the debate rages on: who produces the best macaron of all? While Dalloyau and Lenôtre both make a commendable run at it, everyone knows that there are only two real contenders. 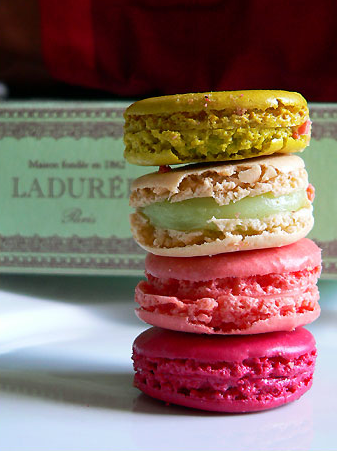 In one corner, we have the elegant and established Ladurée, which has been turning out sweet confections since 1862. 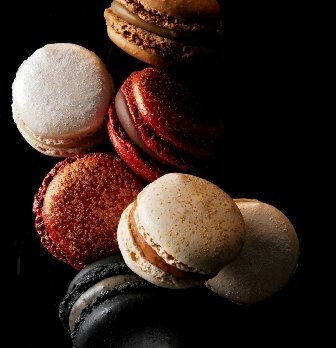 And in the other corner, we have upstart Pierre Hermé, theenfant terrible of the dessert world who worked at Ladurée before setting out on his own. (Word on the street is that the “oppressive” traditions at Ladurée were preventing him from exploring the crazy flavor combinations for which he is now world famous). Naturally, we wanted to get in on the debate, so Sarah (another Hip Paris blogger) and I gathered some friends last week for a comprehensive taste test. Two boxes of macarons later, we reached a nearly unanimous verdict! In the chocolate category, Pierre Hermé blew Ladurée out of the water. The flavor was far deeper, the texture smoother, the overall experience significantly more heavenly. Pistachio went pretty much the same way. But then we came to the most contentious category of all:caramel beurre salé (buttery salted caramel).